Embark on your own beautiful journey through Equestria with our favorite rainbow-colored friends. Inspired by the wild adventures of My Little Pony: The Movie, this 16-piece eyeshadow palette features a kaleidoscope of colors including mattes, shimmers and bold brights. From everyday neutrals to flirty shimmers – all the basics are covered. However it’s the pops of unexpected but wearable colors that work together to create looks beyond your imagination. That’s the Magic of Friendship! KINDNESS (yellow with small pearl), FLUTTERSHY (soft pink with shimmer), GENEROSITY (matte mauve), RARITY (matte white), APPLEJACK (orange with shimmer), HONESTY (brown), LAUGHTER (sparkly mauve pink), PINKIE PIE (hot pink matte), TWILIGHT SPARKLE (pinky purple shimmer), MAGIC (bright purple), RAINBOW DASH (royal blue with shimmer), LOYALTY (dark green with shimmer), TEMPEST SHADOW (matte bright red), SONGBIRD SERENADE (dark purple with shimmer), STORM KING (silver with shimmer), and PRINCESS SKYSTAR (mint duochrome). For a subtle wash of color, apply each eye shadow with the Blending Shadow Brush from the Mane 6 Brush Set. For a more dramatic look, spritz the brush with Miracle Mist for intense color or tap the eye shadows on the lid with your finger. Wet liner brush with Miracle Mist and use Songbird Serenade, Loyalty or Rainbow Dash to create a winged eyeliner look for an unexpected pop of color. Really wish they would sell these colors in same sizes when mine run out. Nice colors in the palette!!! Wish the color black was in it!!! But a good variety of colors!!! Bright, bold colors that last. I am very pleased with this purchase. ordered one for my daughter too. Excellent palette. Fun colors, great to blend, and the most adorable packaging. Exactly what I expected. This was a great price, I love the palette more than I was expecting. Glad I purchased it! I loved this eyeshadow palette! So cute and the colors are highly pigmented and blend well. Definitely a good purchase! Loved all the colors and the theme is awesome. Went on Smooth and so pretty! This was such a cute palette. I had been hoping to get it for awhile and when I seen it was on sale I went for it! This palette is so cute and the colors are great. I bought one for myself and one for my daughter who loves MLP and is starting to be curious about makeup. I love the formula pur has for their shadows it’s so soft feeling and looks amazing! I love this palette, the colors are amazing! I followed a youtube tutorial and it came out so well. Seriously the nicest eye shadow palette Ever!!! The colors go on so light and pretty. I love how long lasting it is and the shimmer is to die for. I was hesitant about all of the bright colors but they go on softly and not harsh at all. I am Soooo happy I got this. A Little Girls Dream Come True. My little girl is obsessed with My Little Pony. I bought this for her so we can get the perfect Halloween makeup. She loves it and the colors are beautiful. I am sure I will be sneaking it from her. I am really happy with my purchase. The colors are so beautiful and pigmented, they blend so we'll. Good color assortment. Blends great! Cute little palette. My 9 yr. old daughter loved this pallet. She wanted her own personal set and this was perfect. The colors are so fun! I love this palette! The colors are gorgeous and applied very well. I absolutely love the colors and no fall out!! Goes on smooth and last all day. Nobody does eyeshadow like Pur and this palette is no exception! Smooth as silk and the pigment is true to what you see. Love the colors!!! I really enjoyed how diverse the colors were. The only reason it isn't getting five stars is a couple of the shades weren't as creamy or blend-able. Colors are fun and vibrant, very pigmented and soft. I bought this for my 5 year old because I don't like her playing with junk makeup, and I will be using this myself too. Gorgeous Palette & Endless Opportunities ! I was so excited when I saw this palette show up! While I admit I'm not a huge fan of MLP and never truly watched it as a kid, I fell in love with the packaging and the bright colours caught my eye! I love the colours, but I've noticed a lack of pigmentation here and there on some, but only on the very light pastel colours (Princess Skystar mostly) but even then it just took a bit of patience and packing and I got the look I wanted! Love this product! Perfect Christmas gift for myself, haha. 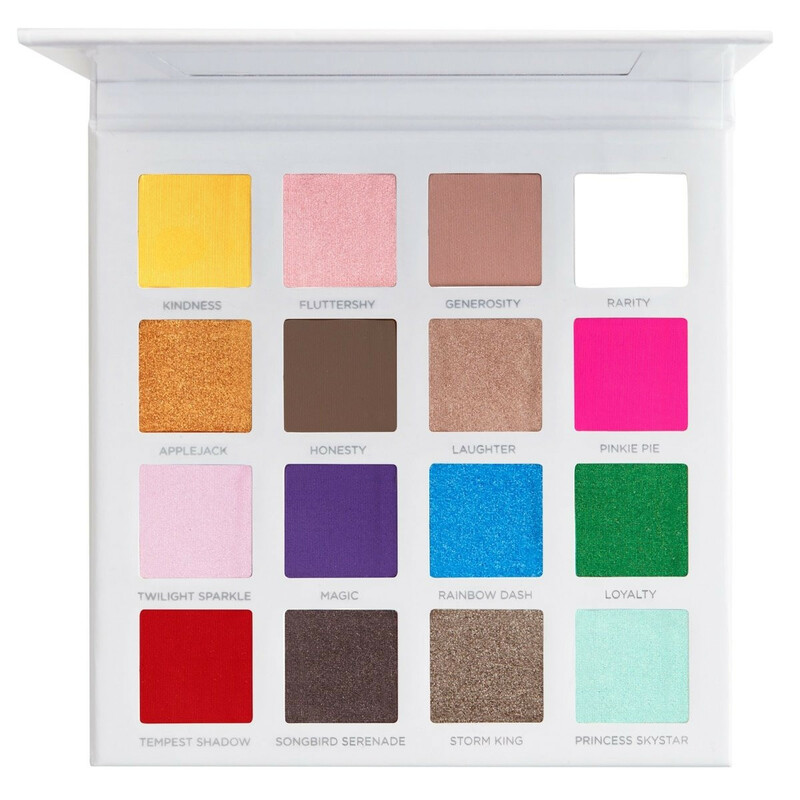 I like this palette it’s bright and pretty but it isn’t as good as the troll palette that’s flat out amazing. It was nice enough. I bought this for my daughter as a gift. It is very pretty and vibrant in person and I am really happy with my purchase. This is my second time purchasing this palette. Such a fun, beautiful palette. Perfect gift for a girl! I originally bought for my daughter and wanted it for myself. Not super pigmented if using without a primer, but perfect colors for the My Little Pony collection. Palette did not come in a box for this order. Looked cheap, palette was wrapped in plastic wrap so couldn’t be gifted. Luckily, this one was for me so didn’t need the box. 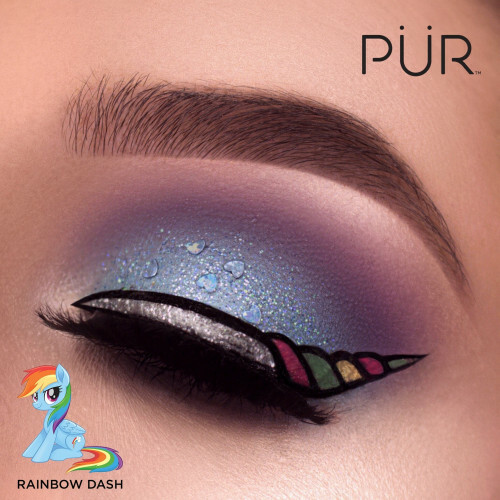 We love Pür and Ponies, so what could be better? I saw this on Charisma TV and knew it would be perfect for my daughter, who only uses Pür, btw. She fell in love! I love the variety of colors this palette has. I tried the red so far and it looked amazing on. I love mlp so I just had to get this palette. Nice mix of shimmery and matte colors, but they're not super pigmented. Nice holographic lettering on the packaging. Should've given a color to Spike. MOP PALETTE DOES NOT DISSAPPOIMT,MIME WAS WONDERFUL! I've waited and waited to score this pallette,ABSOLUTE love the shades. And they blend effortlessly,There such a good mix of neutrals and color,Great pallette for anykme! Beautiful palette and beautiful colors!! I love it! Very pigmented and easily blended. I am obsessed with this palette. Every color is beautiful and I have done pretty looks with them. I especially like the two green shades for a simple and colorful two-toned look. This was my second purchase of this item. I bought it first for my granddaughters to use for play dress up (they are too young for makeup) but because I was once a makeup artist their mom lets me do makeup for them when I visit. I loved it so much I had to have this set of colors for myself! I love love love this palatte. The color generosity should ba a stand alone. It is the perfect cut crease shade. The shade pinkie pie is the most fun to play with and I get so many compliments when I use it. It is my daily go to palatte. Can not beat the price! I love the colors but some of the bright colors can be hard to blend. Overall it’s definitely worth it for the money! I would recommend to beginners as well as experienced muas! Its a super cute and pretty palette and I'm a pretty big fan of the show, but these aren't the best shadows in the world. The purple one is really patchy and will dust away and some are just patchy. I'm about medium tone so swatching the the 3rd shade in the top row doesn't show up on more or the one just below it. Some come off pretty well and are really nice. Do I use this palette every day? No. I have better palettes. But I absolutely love the packaging and wanted this in my collection and sometimes do come to it. I love the bright colors in this palette! It’s so pretty! Absolutely love it! Very, very pigmented... I recommend it 100%. These are really gorgeous pigments and with a little primer, you've got a really gorgeous eye with very little effort. I bought three of these as Christmas presents for my teenage nieces and one for myself. There are enough neutrals in this palette to make it worth purchasing (six browns, two light pinks, a golden that goes on light) and the others are fun for holidays, play, and going out. I'm gluten free and always appreciate PUR for their ingredients, cruelty-free promise. I recommend them to everyone. I love how bright and fun these colors are. I liked it so much I bought two more after they went on sale to give as gifts to my daughters. It was so fun and great to use! I loved it! I would absolutely recommend it! I liked all the colors. It went on great and I am usually allergic to everything and I can wear this all day with no problems. I would buy again for sure! This was a birthday gift for my daughter and she absolutely loved it! Great price and fast shipping too. Not very pigmented but I love the colors!